The end of another year and I am looking at a review of the year's birding. My last sighting for 2010 was Whip-poor-will spotted on a fence post just a couple of hours before midnight on December 31st. As a Lister, I had made an informal goal of 300 birds for 2010. That last whip-poor-will did not increase my tally or get me to my goal, but it was a nice find. ﻿ My actual tally was 279 according to my e-bird world count. This includes several exotics the ABA disqualifies here in Florida, like Purple Swamphens and Mitred Parakeets. But I like finding the established exotics to be just as gratifying as any other highly sought after species. I especially like the various parrot species that can be found in Florida. My family has often kept caged birds like our current bird, a Mustached Parakeet named Alley. I try to take day trips when I can. Favorite locations include Merritt Island NWR (ducks, waders, gulls), Ft DeSoto Park (warblers, shorebirds, kingbirds), The Everglades National Park (white-tailed kites, short-tailed hawks, roseate spoonbill), Lucky Hammock (kingbirds, scissor-tailed flycatchers, lesser nighthawks, swainson’s hawks), the Florida Keys (great white herons, Anatolian nighthawk, roseate terns) and I have added a new location at Cockroach Bay Road ( black-belled whistling ducks, American avocets, Caspian terns). I also have a few favorite spots close to home or to work. 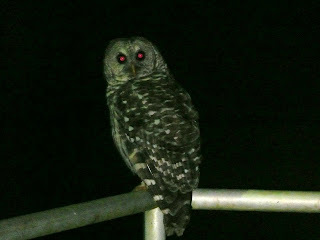 Like being able to enjoy the barred owls that visit us often at my workplace, and being able to watch the burrowing owl families that nested in the fields along Domestic Street. Also took a couple of trips out of state for family events this year – Chicago area and Washington state-Idaho panhandle. Was able to add several lifers, especially out on the western trip. Some of the lifers included Trumpeter Swans, Tundra swans, warbling vireo, Lincoln’s sparrow, western bluebird. Black-billed magpies, American pipits, pygmy nuthatch, red-breasted nuthatch, common raven, California gull, California quail, greater white-fronted geese, western grebe, mountain chickadee, marsh wren, northern shrike and western meadowlark. ﻿﻿ I try to visit Babcock-Webb on a monthly basis and during hunting season check the calendar to avoid visiting on a scheduled hunting day. Right now it is small game season, but not on Tuesdays. So Tuesday morning I am on site at Babcock to witness several of the endangered, Red-Cockaded Woodpeckers exiting their nest holes just after sunrise. The temperatures at dawn are at 45degrees, the sky is clear and the moon in full. Seems that I slept through today's lunar eclipse on this Winter Solstice day. I am standing in the middle of Oilwell Grade road, within the red-cockaded colony sight, which has marked nest trees on both sides of the lane. There are a number of these marked colony sights at babcock, but this is the closest to the main entrance. On schedule the birds emerge and start there day. There are three and each starts there squeaky calling as the peek their heads out of the nest hole. Getting a weather report and exchanging remarks with their neighbors. Then whoosh, they are out, checking nearby trees for a quick meal and will forage for a while, then off they go. Moving on from the woodpecker colony I was able the sight an American Kestrel sitting in the same tree that it was noticed in last month. Could hear Sandhill Cranes several time and Eastern Towhees as well. Odd that I never did spot any today. Heard several House Wrens and was able to see a couple of them. Found a few mixed feeding flocks of Yellow-rumped Warblers, Palm Warblers, Pine Warblers, Red-bellied Woodpeckers, Downy Woodpeckers, Eastern Bluebirds and three Brown-headed Nuthatches. Spooked a Great Horned Owl near Crooked Lake and saw about four Northern Harriers. Other raptors experienced here was hearing the call of a Red-shouldered Hawk an a kettle of five immature Bald Eagles soaring near Webb Lake. Eastern Meadowlark were seen and heard through-out the property. Sparrows were seen mostly in wet fields, as were Common Yellowthroats. Primarily Savannah Sparrows and found a single Swamp Sparrow in the brush along the Seaboard Grade road. In that brushy spot, had a couple of the common yellowthroats and a surprise of a Marsh Wren. Marsh and sedge wrens are nemesis birds for me. This was only second sighting of a marsh wren, the first in Florida and I have yet to identify a sedge wren. Was also pleased to find a Grasshopper Sparrow along Tram Grade road. I initially tried to identify it as a bachman's sparrow, but that white strip atop the crown on this bird marked it as a grasshopper sparrow. Besides missing on the bachman's sparrow today were red-tailed hawk and northern bobwhite. The refuge camping area was overflowing with tents, campers and swamp buggies. Lots of sportsman on sight for the various hunting activities here. The white-board at the check-in sight listed the game that had been taken so far this season. I recall seeing that seventy-six deer had been harvested along with four hundred plus hogs, over sixteen-hundred snipe and about six hundred quail. Also listed were small numbers of other animals harvested including raccoons, squirrels and coyotes etc. 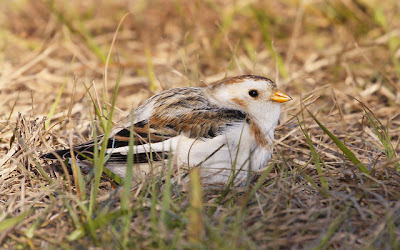 It was a hard decision whether to chase after the sighting of a Florida rare bird, in a Snow Bunting at Palm Coast, Florida, or to head south toward the Everglades, were other intriguing reports are being posted. I had run into an active birder and photographer, Reinhard Geisler and his wife, on my last visit to Harn's Marsh. He was encouraging about going after the bunting and the continuing postings on how this bird has steadily remained on a very small patch of grass and should be an easy tick. Well I elected to chase after the snow bunting regardless of the four and a half hour drive to get there and the fact we are in the midst of record cold temperatures. Left home at 4 am with temperatures in the 30's. The wind chill temperature at Waterfront Park had to be in the teens. Ice had formed on the sidewalk and the landscape plantings were decorated with ice as well.﻿﻿﻿ The buntings location was roped-off to provide a safe zone. Seems the bird had almost been stepped on by the curious and now we have to kept back. So far back that my photo attempts produced poor shots. But those with the patience and the correct camera gear could still pervail. Photographers that were here before the barricade could step up to a few short feet for great shots. About seven freezing observers were already on site when I arrived and one nice lady offered looks through her scope. It is a beautiful bird. But why was it it here so far from its normal territory. An a real irony was a bird from the far north is found in Florida during a record cold spell. I planned on stopping at Smyrna Dunes Park to look for resident purple sandpipers, but because of the cold I chose to drive onto Merritt Island National Wildlife Refuge. But first I did stop at Flagler Beach to check out for any interesting gulls or pelagics. Was able to easily spot and identify Northern Gannets﻿﻿﻿, but most other interesting birds were to far out for my binoculars. Needed a scope. A large flock of dark duck like birds flew past just above the surf. Again too far out for gathering good details for identification, but my guess were that they were a scoter species. Maybe white-winged. Other birds included Brown Pelicans, Royal Terns, Forster's Terns, Laughing Gulls, Ring-billed Gulls, Ruddy Turnstones, Sanderlings and Black Skimmers. Got to Merritt Island at noon and spent about three hours on the Black Point Wildlife Drive and on the Lab Beach Road. 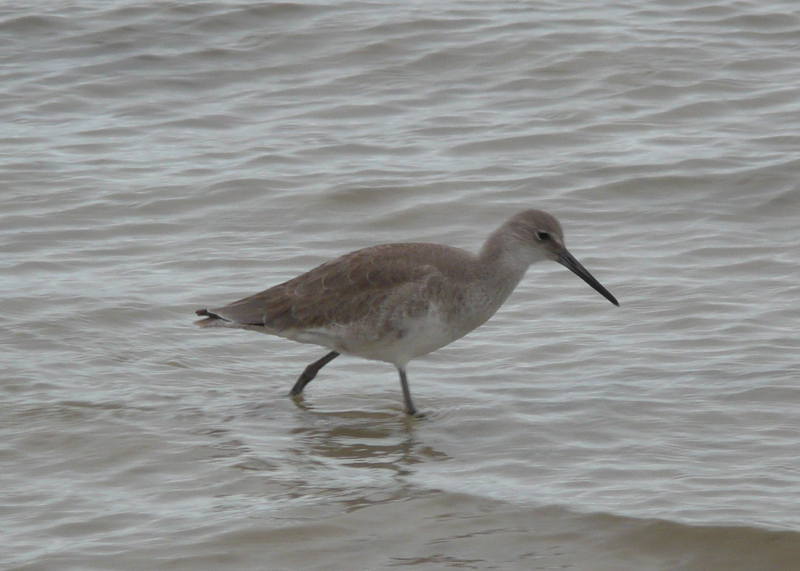 I found Long-billed Dowitchers, lots of Dunlins and Sanderlings, a few Greater and Lesser Yellowlegs. And a single Red Knot. Also had large numbers of wading birds like White Ibis, Wood Storks, Roseate Spoonbills, Great Egret, Snowy Egrets, Great Blue Herons and Little Blue Herons. American White Pelicans were plentiful and several Caspian, Royal and Forsters Terns were found. As for raptors I only saw one Osprey, one Northern Harrier and a couple of American Kestrels. No ducks were seen at all on the Black Point drive. Water levels seemed to be too low for them. Also missed were any avocets, stilts and on the tundra swans reportedly seen earlier in the morning, but seen elsewhere on the refuge. The Lab Road was very interesting. Had hoped for another shot at any black-backed gulls or Bonaparte's gulls, but missed. My best bird on the road was Peregrine Falcon. Was able to find some ducks and tons of American Coots. The ducks included Ring-necked Ducks and Hooded Mergansers. Also had four warblers - Common Yellowthroat, Palm Warbler, Yellow-rumped Warbler and a lone Black-and-White warbler. 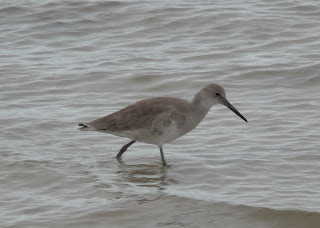 Shore birds include a lot of Western Sandpipers, Dunlins, Sanderlings and Ruddy Turnstones. A couple of royal Terns a several Ring-billed Gulls, plus American White and Brown Pelicans were present too. Only spotted a single gator all day, but almost missed It because it was camouflaged with a coating of dried mud. And now time for the lone drive home. Most of the expected winter resident birds have made their appearance here in Lee County. American Robins and Cedar Waxwings are inconsistent about when we may see them in our neighborhoods. I have not seen any yet, but it is probably a bit early, especially for the waxwings. However, seems that most of the expected duck species are here. Got a pair of Hooded Mergansers at Harns Marsh on the on the 10th and Red-breasted Mergansers back on November 21st on the ponds at Domestic Street. 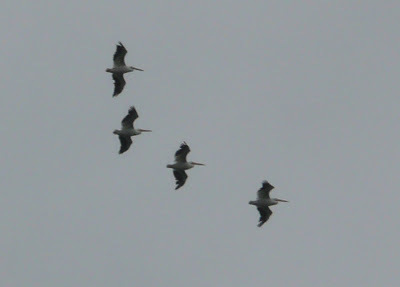 I saw my first American White Pelicans of the season on December 1st at Bunche Beach, though they had been around for a couple of weeks already. Saw my first Common Loon at Bunche Beach on December 8th. Just this morning I found my FOS Painted Buntings at the feeders at the White's property in Alva. These feeders were active with American Goldfinches and Indigo Buntings. Had located my first-of-season American Goldfinches as a flock were actively feeding in the trees along the boardwalk at Six-Mile Cypress Slough Preserve on the December 7th. The same day had a pair of Ruby-crowned Kinglets chasing each other through the understory and flashes of the males red crown could be as they flitted about. My FOS on the these birds were on November 15th. Still looking for the Black-throated Blue Warbler that has been reported at Six-Mile Cypress. Other species on hand for the winter include Gray Catbirds, Eastern Phoebe, Yellow-bellied Sapsuckers, American Bitterns, House Wrens, Palm Warblers, Yellow-rumped Warblers, Savannah Sparrows, Grasshopper Sparrows, American Kestels, Merlins, Blue-winged Teal, Dunlins and so on. One of the things that makes birding fun is that you never know what you'll find at any given time. Dawn was breaking as I headed home from work this morning. Was considering doing some birding instead of heading home for sleep. But being arrears on my sleep, I elected to just check out my spot on Domestic Street on the way home. Tons of American Coots were spread across the ponds there. A couple of Redhead ducks continued to seen here, plus a few Ring-necked Ducks and Lesser Scaups as well. Not much else was around, but as I was scanning the ponds a small raptor flew right into my line of sight and settled on a fence post. Cool. It was a Merlin. I had not seen a merlin at this sight before. The presence of the falcon could explain way I could not find any sparrows or palm warblers. This bird remanded seated for a few minutes and then flew into the brush further down the road. Must have spotted a candidate for breakfast. Headed home to find a large flock of White Ibis foraging on my block. Counted about forty-five ibis. They are surprisingly tolerant of traffic. These are our yard birds. The robins should be arriving sooner or later, but the White Ibis are cool to see. I had an acquaintance down in Naples who's family descended from early south Florida pioneers. These folks had to live off the land and sea, as the only access back then was by boat. No roads existed. My understanding was that they referred to the ibis as Chokoloske Chickens. It took about four birds per person for a meal and that the 'Bronze-wings' or juveniles made for better eating. They are protected know. .
As I was walking the dogs and watching the ibis', a trio of Muscovy Ducks flew right over head. They are large birds in flight and were followed by a Great Crested Flycatcher, who settled in a neighbors tree. Like I said, you never know what you'll find. Spent a couple of hours at Bunche Beach this mourning. 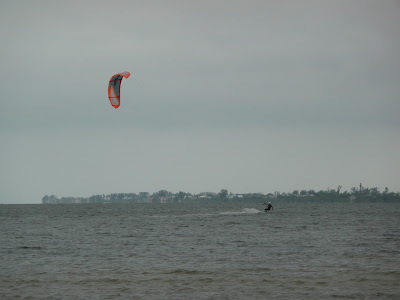 The weather was overcast, breezy and cooler. Only a few walkers and surf fisherman present. 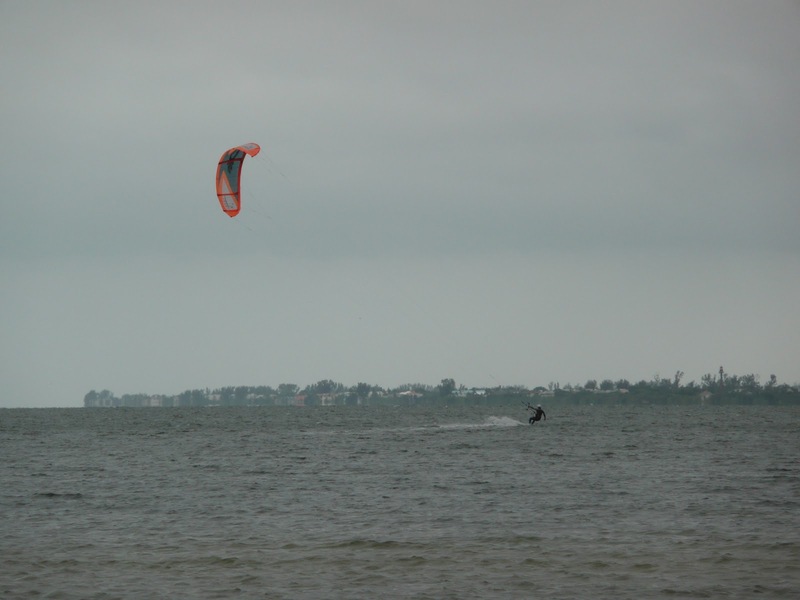 A couple of kite-surfers are sailing across the bay,. Still looking for American White Pelicans here. Had found five yesterday up in Hillsborough County. Present today were hundreds of gulls, terns, and shore birds. Had to be a couple of hundred Black Skimmers, about sixty Laughing Gulls, about six Ring-billed Gulls, a dozen Royal Terns, the same with Sandwich Terns and a few Forster's Terns. 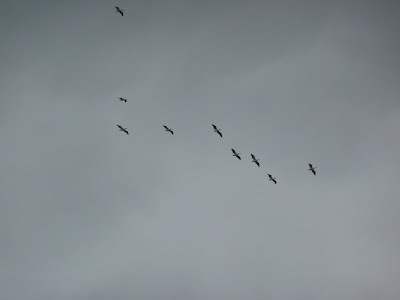 Scanned through these flocks several times over two hours looking for any Herring Gulls, but not seen today. Also scanned the flats looking for the Long-billed Curlew that is occasionally seen here. Did see all of the expected shore birds like Black-belled Plovers, Semipalmated Plovers, three Piping Plovers, Short-billed Dowitchers, Marbled Godwits, Willits, Least Sandpipers, Western Sandpipers, and the most commonly seen bird were Dunlins. No curlew though. A very interesting sighting was a pair of Bald Eagles trying to both sit on the same pyling. Eventually one flew off. 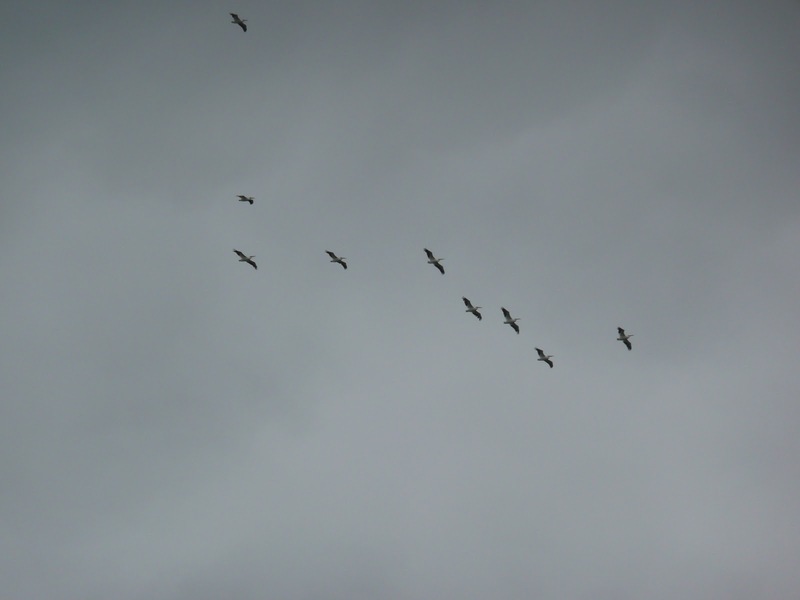 As for looking for the American White Pelicans, I was finally successful in with seeing a soaring flock just as I was leaving at noon.